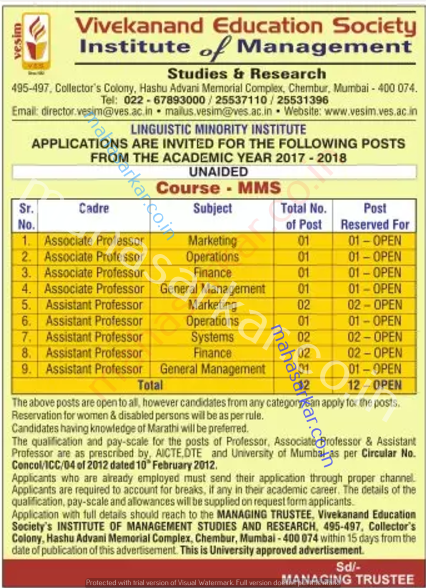 VES (Vivekanand Education Society institute of Manageent), Mumbai Published Job Notification for 12 Associate Professor (Marketing) – Associate Professor (Operations) & More Posts. Candidates who wish to apply must look at VES Recruitment 2017. Eligible candidates can apply offline before 15 days of publication. Interested & Eligible candidates may attend for walk in interview along with all the documents addressed at The Managing Trustee, Vivekanand Education Society institute of Manageent Studies and Research – 495497. Starting Date, Last Date to Apply Offline at Vivekanand Education Society institute of Manageent which candidates should be remember as follows. Start Date to Apply Offline: 18-07-2017.